This page is dedicated to all the pugs we have rescued. Their adoption photos and stories will be placed here as well. To view Rescued Pugs from previous years, select the year you want to view from the dropdown. 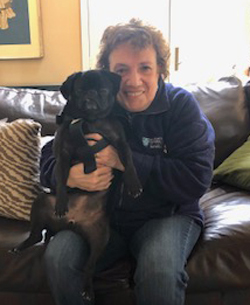 On April 13, 2019, Stanley, pug #08-19, was adopted by Susan and family of New Hampshire. Stanley came to GMPR as an 18 week old puppy who was surrendered in love because his family realized they didn't have enough time for him. First time puppy owners, they were not quite prepared for all that a puppy entails. Stanley’s new family has been waiting a year for the right rescue to come for their two young boys. This is going to be a lively home. On March 31, 2019, Daisy, pug #09-19, was adopted by Lori of New Hampshire. Daisy is a 15 month old female pug who was surrendered due to changes in job scheduling. Daisy was being left at home for long hours and her family knew she needed more out of life. 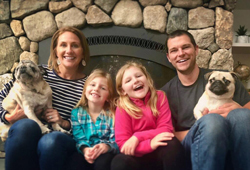 Daisy joins GMPR alum Jake, who was adopted at age 16, and a pair of young ladies who are excited about having the energy of a young pug in the family. 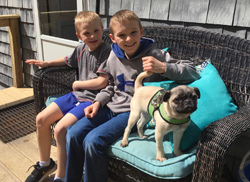 On April 7, 2019, Summer, pug #11-19, was adopted by Keith and Heather of Maine. Summer is a 3 yr old female pug who was surrendered due to a death in the family. Keith hopes to make Summer “his” pug since their other pug is attached to Heather. This petite and lively girl joins GMPR alum Rosalind to make the family complete. Congratulations, Keith, Heather and Summer! 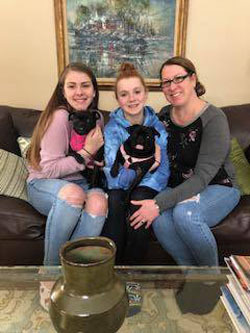 On April 7, 2019, Pepper, pug #10-19, was adopted by Margaret of Massachusetts. Pepper is a 2 1/2 year old, spayed, female pug who was surrendered in love because her owner was required to work extra hours. Margaret has been looking for a velcro pug who will be her constant companion and enjoy daily walks and romps in the fenced yard. Life just got a whole lot better for Pepper and Margaret. 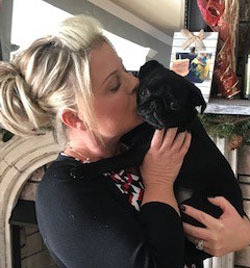 On March 11, 2019, Miss Maxie, pug #03-19, was adopted by Jodie of New York. 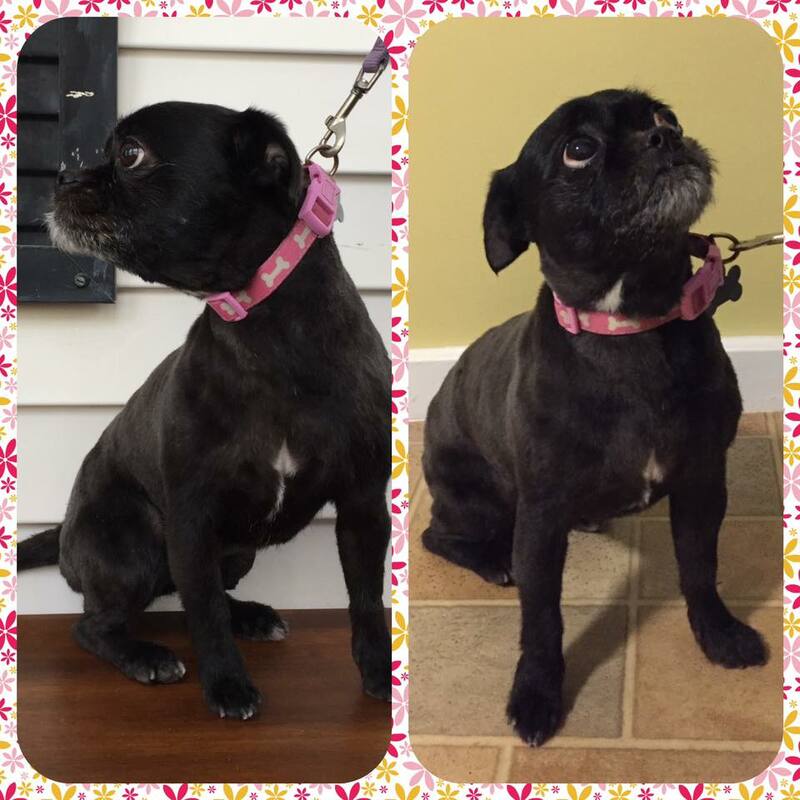 Little Miss Maxie is an 11 year old Pug/Terrier mix. She is just a little bit of a thing, weighing maybe 10 lbs. Maxie was surrendered to GMPR in love, because she was not dealing well with the toddlers in her home. Maxie is one of those velcro pugs who wants to be with her person as much as possible. Jodie will be available to spend lots of time with Maxie and was excited to bring her home to start her new life. 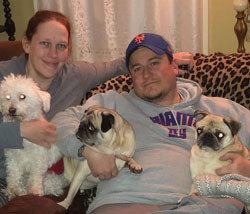 On March 2, 2019, Gus, pug #2-19, was adopted by Mike & Melissa of New York. Gus is a very sweet loving 12 year old neutered male pug, who found himself at the Mohawk Hudson Humane Society. They contacted GMPR in the hope that we could take this little man and of course we were happy to do so. Gus is a typical geriatric pug. He has a very weak, wobbly hind end. He is ambulatory, but ultimately may need a wheel chair and we are hoping to get him fitted for one in a couple of weeks. Gus needed a home willing to take the time to give him the extra attention and care he will need and Mike & Melissa were more than ready to take on the challenge. 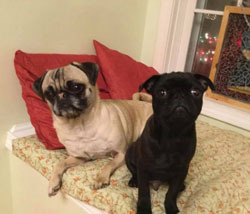 On March 2, 2019, Pickle, pug #04-19 was adopted by Suzanna of Vermont. Pickle is a 15 month old female pug that was surrendered in love because of a new baby and some major changes in the family dynamic. Pickle has luxated patellas but surgery is not an option for Pickle at this time. She is not in any pain and gets around really well. Pickle just has a very bow-legged hind end and not as much strength as she should have. A weight loss program including exercise will be necessary to get her healthy and strong. Suzanna has a 2 yr old pug/boston terrier mix, so Pickle will get plenty of exercise playing with her and hopefully the extra weight will soon disappear. 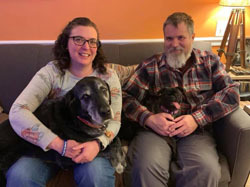 On February 27, 2019, Lola, Pug #19-05 was adopted by Emily and Mike of Vermont. Lola is a 9 month old brindle, female pug that was surrendered to GMPR because her owner did not have time to give her the attention she needed. This sweet brindle is the life of the party! She loves to run and play with other dogs. She will get to look forward to lots of play time with her big fur brother, Arlo!! She will also get to spend quality time with her new human Daddy while he works from home everyday. When Emily met Lola it was love at first sight and she knew it was time to fill the void that their last pug, Maxine, left when she crossed the rainbow bridge last year and find a new best friend for their dog, Arlo, who was also missing his pug friend. Emily and Mike had adopted Maxine from GMPR back in 2015. We can’t wait to see them at this year’s social and have Lola compete in the longest tongue contest!! Congratulations Emily, Mike and Lola!!! On February 9, 2019, Wally, pug #68-18, was adopted by Elizabeth of Vermont. Wally now named Ozzie is a 17 week old puppy that was surrendered to GMPR by a breeder in Virginia as he had some corneal scarring and a hernia that needed medical care. Wally was taken to the ophthalmologist and it was felt that hopefully with eye medication his eyesight would not deteriorate. Elizabeth is a GMPR alumni and adopted Rex in 2017. Rex was a young dog that came to GMPR with a severe deformity of his front legs. Because Rex was unable to interact and play with other dogs normally, Elizabeth wanted a young buddy for him that would accept him the way he was and not realize that he was different. Rex and Wally get along very well and have formed a strong bond. On January 27, 2019, Sonny Ray Jr., pug #69-18, was adopted by Jessica and Tony of New York. Sonny Ray Jr. is a 17 week old puppy that was surrendered to GMPR by a breeder in Virginia as he had some corneal scarring that needed medical care. Sonny was taken to the ophthalmologist and it was felt that with eye medication and given time the scarring would resolve. Jessica is a GMPR alumni & new board member of Green Mountain Pug Rescue. Jessica and Tony had been looking for another pug for some time. Sonny is named after famed Sonny Ray of GMPR fame, those are some pretty big shoes to fill. As the only boy in their pack, he will be King of the Castle and live the life every Pug should. 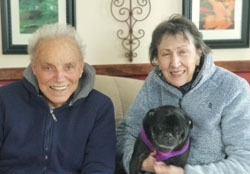 On January 26, 2019, Ruby Sunshine, pug #44-18 was adopted by Dianne & Robert of Connecticut. Ruby is an 8-9 yr old spayed, female pug. She is a sweetheart who wants to be with her human constantly, sleep with them and follow them from room to room - she is definitely a “velcro” pug!! Ruby does not like to share her human with other dogs and we therefore needed to find her a home with no other pets. Dianne & Robert lost their last 2 pugs in 2018 and were ready to take another senior. They have lots of pug experience and Ruby will be very happy to have a home where she does not have to share her human with other dogs!! Congratulations Dianne, Robert and Ruby Sunshine.